found this on ebay. 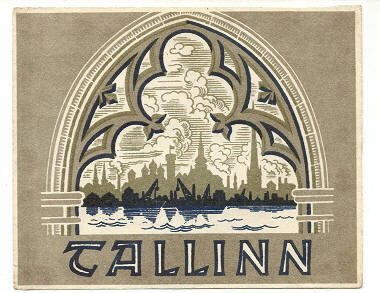 nice cigarette label illustration of Tallinn, capital city of Estonia. Enjoy Estonian Independence Day tomorrow! Happy Estonian Independence Day, Erik! Ooh, that IS a nice illustration. Did Estonia win independence from Russia/USSR? This illustration shows so much! 1) The white architectural frame shows a pillar style. 2) The inner frame shows a church pattern with the trinity circles. 4) The blue skyline of construction buildings working on new structures. THE BEST PART: 5) The reflection in the river shows the new buildings to come! 6) The river shows that Estonia is built by the water. 7) Blustery clouds show brisk weather. The only thing missing is the representation of technology. The silhouettes of the construction can sorta represent that.